Join us Saturday, January 6th, 2018 at 11:30 AM as we host a vision journaling workshop led by Houston's Rae Alexis of the #PositiveSelfTalk movement. Last year we made vision boards; this year we will learn the powerful art of vision journaling. Join a room full of success-minded women as we come together to celebrate our year! There will be plenty of opportunities for us to toast to our 2016 accomplishments. This is the ultimate celebration for women, by women. A delicious brunch, succulent mimosa bar, and journaling workshop are included with your ticket. 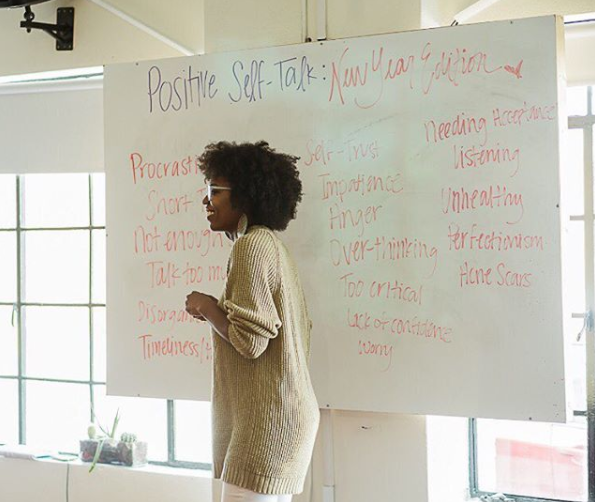 After our decadent brunch, Raveen Alexis, the creator of #PositiveSelfTalk, a series of journaling workshops that provide guidance on healthy self-care practices by way of written expression, will lead a vision journaling workshop. Raveen is Houston-based writer and curator whose mission is to tell the stories of Houston creatives who are making their mark in the city. Raveen's work and overall life is dedicated to helping herself and others become the best version of themselves. You can follow Raveen on IG - Twitter - FB or visit her website: www.theraveenalexis.com. Dress Attire Requested: Think lace statement pieces in neutral or muted gem tones (e.g. blush, navy, burgundy, emerald, cream). See our Pinterest board for inspiration! Join Houston's Freeing She community as we celebrate sisterhood, celebrate each other, and celebrate what we will manifest in 2018! |Felici(tea) means happiness.| The where, the when, the how, people find happiness is a beautiful sacred experience that allows us to meet the best versions of ourself. Felci(tea) Lifestyle Tea Company’s uniquely crafted detox blends are created to inspire these blissful moments while promoting a healthy and balanced lifestyle. We create with your health & happiness in mind. FlashBar Photo Booth launched early 2017 in Houston, Texas. Our business strives to provide a fun and memorable experience for each host and photo booth user. Whether it be a wedding, party, or corporate gathering we want our customers eager to share the FlashBar experience with others. Sharifa Creates Studio is the official shop for Houston-based Sharifa Creates blog. Sharifa Creates Studio brighten homes with peace, love, and joy through original pieces of abstract artwork and lifestyle pieces. On the blog Sharifa Creates, you can find unlimited DIY craft and sewing tutorials. Urban Love Tree is a media company that specializes in capturing the culture through photography and digital cinematography. Our team of creatives thoughtfully craft authentic visual stories of our clients and community with love, professionalism, and a belief that who you are is just as important as what you have to offer.